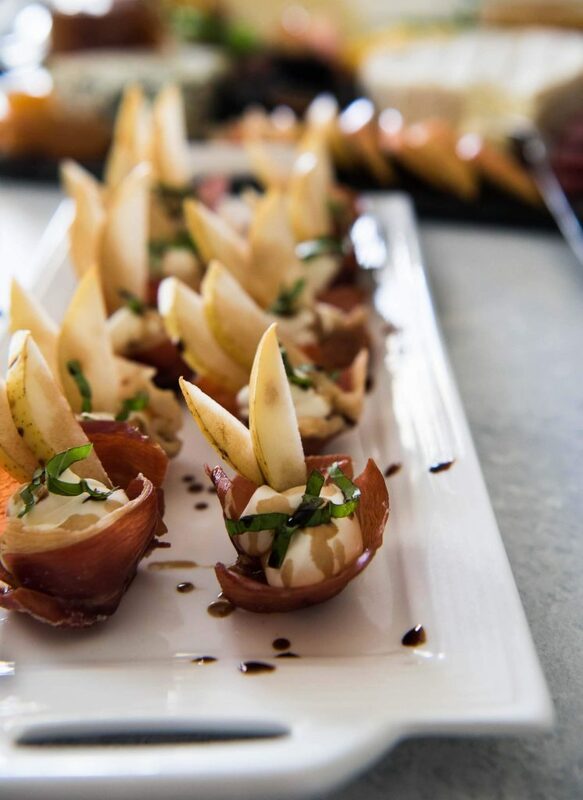 Looking for the fanciest, easiest appetizer ever? 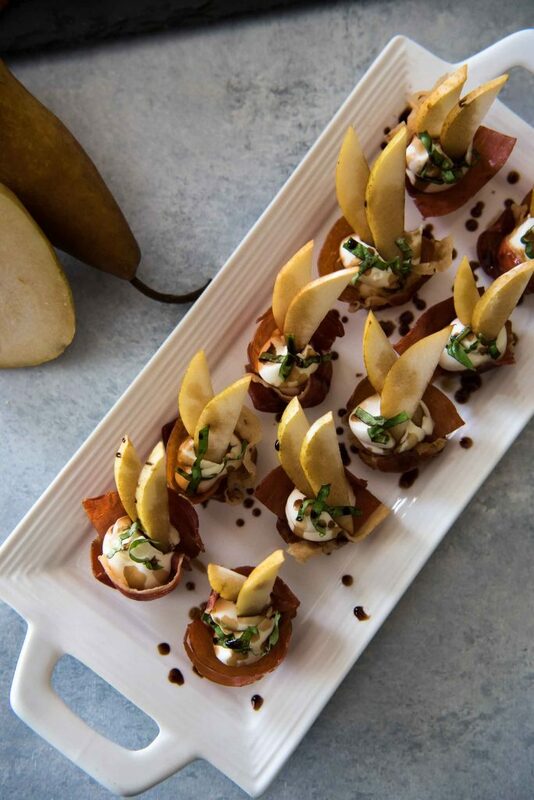 Crispy Prosciutto Cups with Pear & Mascarpone are the answer – simple flavors, simple prep, max deliciousness! It has been a party weekend for sure. It’s a totally different experience for me now that I’m working to help keep it running smoothly But if you think that’s stopped me from enjoying all the food, wine, and laughs? NO sir. Friday night kicked off the weekend with the welcome reception, culminating with the Taste of Rosen Shingle Creek. Imagine a big, round room full of endless small plates. 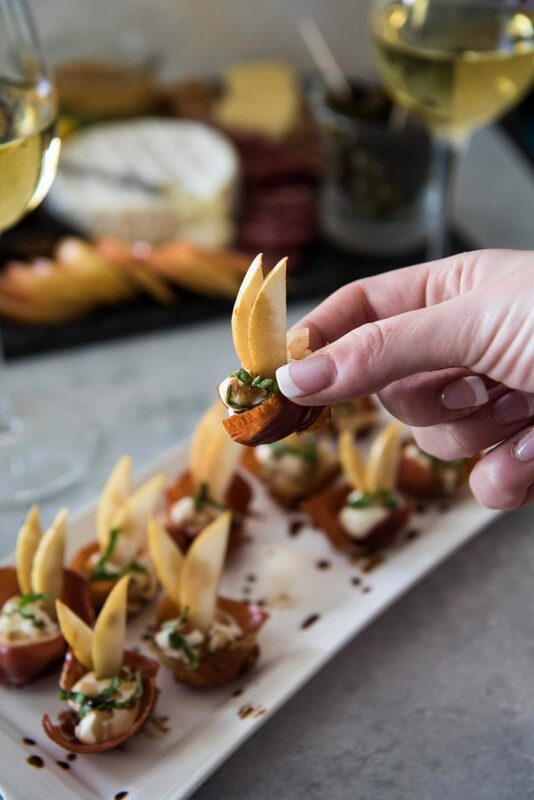 Adorable hors d’oeuvres. Happy apps. Tasty tapas. Come at me with more alliterations, bro. Going back for the third round of three-bite fried lasagne was not frowned upon, folks. In fact, it was encouraged. Party foods come in two categories. Large potluck platters of goodness, like Buffalo chicken dip, baked ziti, and burgers on the grill. In the other category are the cutesy little bites of delightfulness that make everyone “ooh” and “ahh” and snap pictures of them for Instagram before downing them in one bite. That’s my kind of party snack. Eat enough and call it dinner! 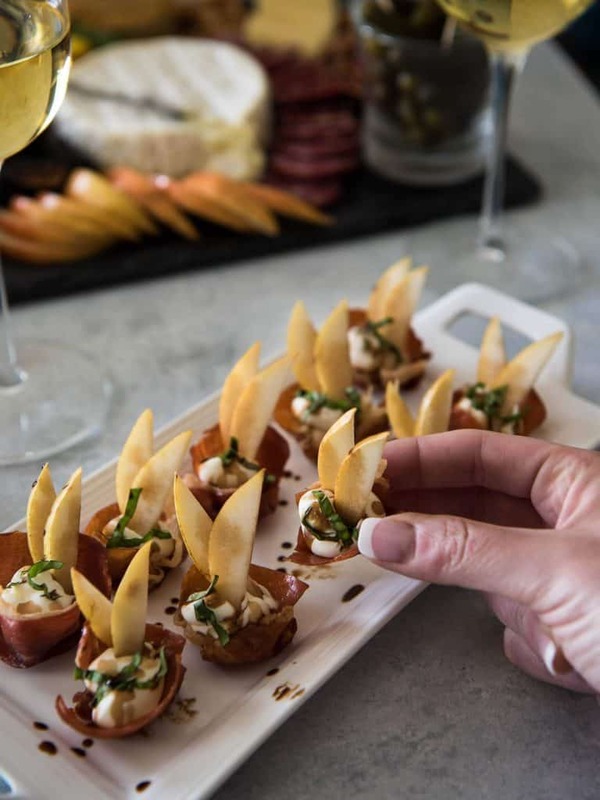 These sweet little Crispy Prosciutto Cups are so simple to throw together and your next party should have them on the menu! Not to mention, they’re delicious – sweet and savory at the same time. 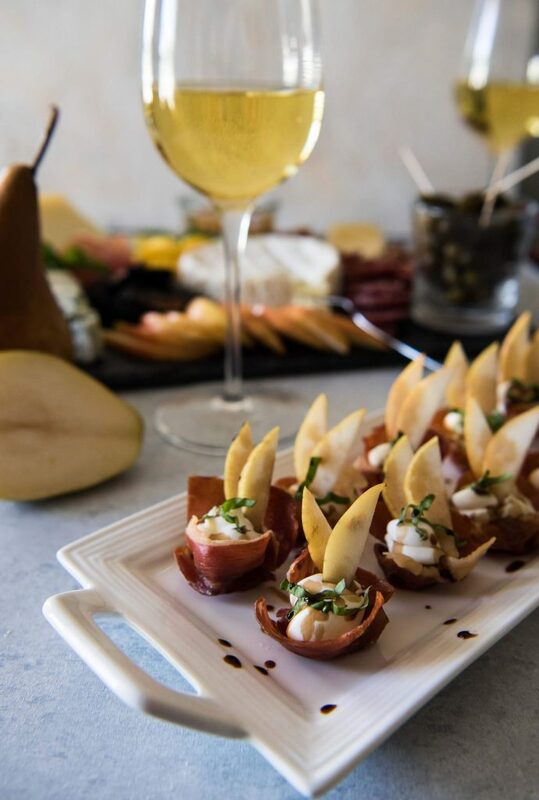 The velvety mascarpone plays well with the sweetness of the pear, all nestled in the delightfully crunchy itty-bitty prosciutto cup. Textures galore here, folks! Add the basil and balsamic for a bit of earthy, herby goodness and a little tang and your guests will go crazy for them! Dinner tonight is a bit heavier, but our LIVE Twitter party from Tapa Toro tomorrow night will be more tapas-friendly – and I, for one, can’t wait to enjoy their paella for the second year! Looking for the fanciest, easiest appetizer ever? 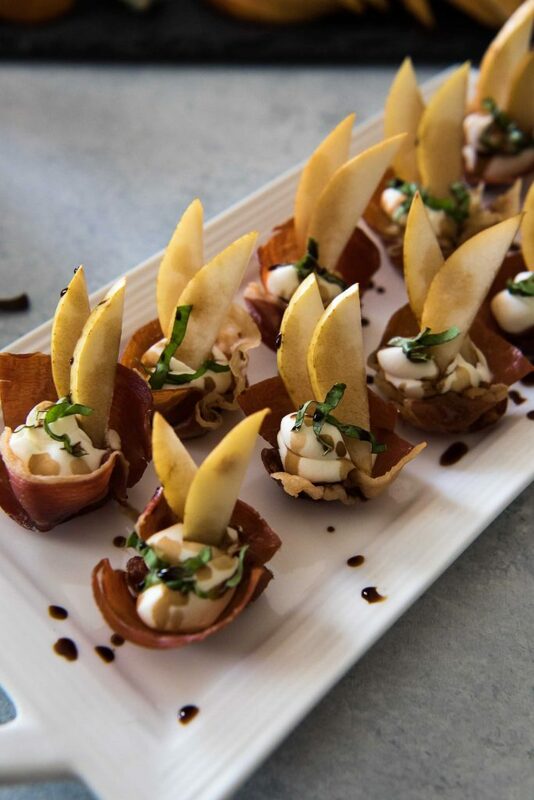 Crispy Prosciutto Cups with Pear & Mascarpone are the answer - simple flavors, simple prep, max deliciousness! Cut prosciutto into 24 two-inch squares. Place one square (overlapping any tears) in each cup of a mini cupcake pan. Bake 15 minutes, or until fat turns golden. Remove from oven and use a fork to immediately transfer to a paper towel to drain; cool completely. Spoon mascarpone into a pastry or zipper bag. Pipe cheese into cooled cups. Top with slices of pear and basil, then drizzle with balsamic glaze. Oh these are so cute Erica, love everything about them. These are absolutely positively gorgeous! These are so pretty and I’m sure they are delicious too! I love those prosciutto cups!!! So fabulous with the creamy mascarpone and sweet pears! Such a fun appetizer and I love that they come in an edible container! These are so cute…and bonus lo-carb! Love the sweet pear with the salty prociutto! Lovely presentation for any party! It’s hard to imagine that these are easy! Elegance at its finest. what a unique appetizer for entertaining! 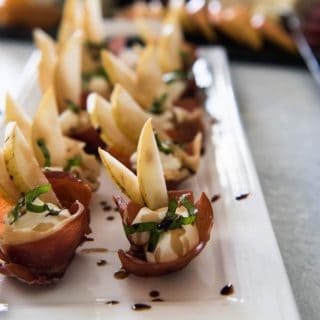 I’ve been looking for some new and creative ideas for small bites and these look great! Nice set of ingredients and uniquely grouped with prosciutto, Mascarpone and pear! Thank you for this recipe!